It is a real delight to join you at the Graduation Ceremony 2018 of the University of Huddersfield. Let me begin by extending my congratulations to all the graduates on completing your studies and embarking on a new journey to pursue your dream! I would also like to take this opportunity to pay tribute to all the faculty members for your hard work! Since I became Chinese Ambassador to the UK eight years ago, I have visited many British universities. But this is the first graduation ceremony that I have attended. Here, looking at so many youthful and eager faces, I know this is a significant moment. First of all, this is a moment to review what you have achieved. 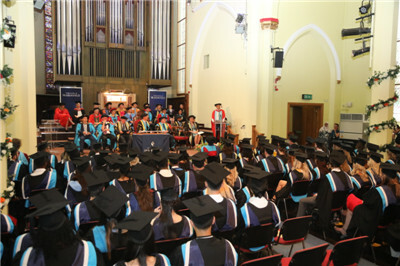 Huddersfield is one of the universities recognized by the Higher Education Academy for excellence in teaching. I have learnt about your remarkable record in education, student satisfaction, internship and career opportunities, faculty training and joint scientific research, and I admire your educational concepts and humane spirit. It therefore came as no surprise when you were given the HEA's 2017 Global Teaching Excellence Award and ranked highest in student satisfaction by the International Student Barometer this year. These achievements could not have been possible without the personal care of His Royal Highness The Duke of York, and the hard work of all the faculty members and students. I congratulate you on these achievements! Second, this is a moment to appreciate the friendship that you have built over the years. For China and the UK, we have seen fruitful outcomes in educational exchanges in recent years. These are highlights in our overall bilateral relations. The contribution to these highlights by Huddersfield is particularly noteworthy. You are constantly scaling new heights in your cooperation with China. 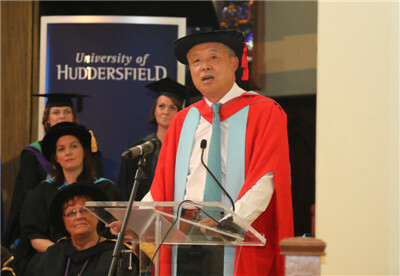 As of today, Huddersfield is home to over 1,000 Chinese students. You have established partnership with over 100 Chinese universities. You have carried out various forms of cooperation with dozens of Chinese educational, cultural and media institutions. You are about to open another joint campus in China this year. What touched me most is that you are the first foreign university to donate to a Project Hope primary school on Chinese mainland. Third, this is a moment to embrace changes in your life and welcome a bright future. Changes provide inexhaustible power for progress. Changes create opportunities. In today's world, the waves of reform and innovation are surging, and this promises great potential for China-UK cooperation. China has adopted an innovation-driven strategy known as "mass entrepreneurship and innovation". This promises a huge market, abundant capital and capable minds for international cooperation on innovation. Pitch@Palace founded by His Royal Highness The Duke of York in 2014 has moved along with this global trend of reform and innovation. It is designed to provide innovative industries and start-up businesses with opportunities to succeed. Not long ago, His Royal Highness visited China for the finals of the second Pitch@Palace China. That visit further increased the popularity and influence of this programme in China. As President Xi Jinping said, China-UK cooperation on scientific and technological innovation will deliver win-win results and enrich the China-UK "Golden Era". I sincerely hope that with our joint efforts, China-UK cooperation on innovation will bear new fruits and open up a more beautiful future for the development of our two countries. 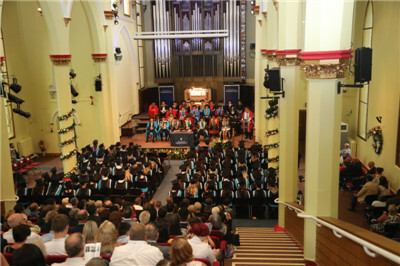 Today, while marking your graduation from Haddersfield, we are also celebrating the beginning of your education in another university, the "university of real life". At this significant moment, may I share with you my three hopes. First, I hope you will embrace the world with an open mind and inclusive attitude. The world is now undergoing profound changes unseen in a century. The international landscape is changing drastically. Peace and development are still the main theme of our times. But unilateralism, protectionism and xenophobia sentiments are surging, and the dark cloud of trade war is hanging low. The world faces a critical choice between openness and isolation, between progress and retrogression, between dominance and win-win cooperation. History has showed us time and again that openness brings progress, isolation leads to backwardness and cooperation delivers win-win results. Our world is a community with a shared future, where the interests of all countries are intertwined. Only with better connectivity and integrated development can we achieve common prosperity and improve the wellbeing of everyone. Only with inclusiveness and harmonious coexistence can we promote mutual learning between civilizations and enhance friendship between the people of all countries. Seeking dominance or adopting a "beggar-thy-neighbor" approach is counterproductive and will only lead to a dead end. I hope that young graduates like you will seize the trend of the times and become champions of openness, cooperation and mutual learning between countries of the world. Second, I hope you will open you eyes to a changing China. This year marks the 40th anniversary of China's reform and opening up policy. In the past 40 years, the Chinese people have successfully blazed a path of socialism with Chinese characteristics. This has not only brought profound changes to China itself, but also made important contribution to growth and progress in the world. China contributed over 30% to world economic growth every year in the past six years. China will work with other countries to safeguard world peace and promote common development with a goal of building a community with a shared future for mankind. China will keep to the path of peaceful development based on mutual respect and win-win cooperation. China will build the Belt and Road Initiative under the principles of extensive consultation, joint contribution and shared benefits. And China will take part in the reform of the global governance system guided by the principle of fairness and justice. Third, I hope you will promote cooperation with an enterprising spirit. I can see many Chinese faces in the audience. You represent over 170,000 Chinese students here in Britain and while you are here, you have seen how China-UK relations have grown in the past years. This year, China-UK "Golden Era" is shifting into a higher gear. The overall cooperation between our two countries is making steady progress. We are building an increasingly strategic, practical, global and inclusive relationship. I sincerely hope that my young Chinese friends will cherish the times, take a down-to-earth approach and dare to be innovative and enterprising. I hope you will devote what you have learned to China-UK friendship and cooperation. I hope I can count on your contribution to the China-UK "Golden Era" and to the exchanges between China and all the countries in the world. Every nation looks to its young and daring to lead the way forward. In deed, our young people have in their hands the future of our countries and the future of China-UK relations. So I hope you will seize the opportunities and aim for excellence. I hope you will give full play to your youthful vigour and intelligence to go after your dreams and achieve great feats that is worthy of our times. I hope you will join hands to write a new and more splendid chapter for a community with a shared future for mankind. 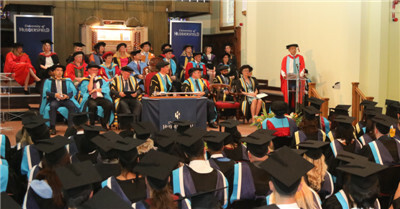 In conclusion, I wish the University of Huddersfield continued progress and greater success.